A few years ago, anarchist philosopher Crispin Sartwell argued that “the left/right or Democrat/Republican split—which turns American politics into a hyper-repetitive, mechanical set of partisan bromides about free markets versus government programs with egalitarian results—depends on a historical mistake.”1 While Sartwell was pretty much on point with this assessment, we haven’t yet been able to cast aside these self-imposed political blinders. Americans by and large still see politics through the left/right prism, without realizing that our perceptions of what constitutes ‘the left’ in particular are intrinsically flawed. In modern American political culture, the descriptor ‘left’ is commonly used with reference to Democrats, liberals, progressives, and even moderates. However, there are barely any truly leftist currents in our mainstream political landscape. In addition to being guilty of having committed Sartwell’s collective ‘historical mistake,’ this erroneous delineation of ‘the left’ not only defies political realities in the rest of the world, but it also perpetuates the deception we have created in our own political understanding of ourselves. American claims to being exceptional among the civilizations of the world are in many ways an overblown nationalistic myth. But there is one particular strand of American exceptionalism that has long been a mainstay in our political culture and in the vernacular we employ within it. On a daily basis media outlets, politicos, pundits, thinkers, and commentators – and thus, by virtue of information consumption, the general public – fall into an all too common trap of political misperception, myopia, or willful misappropriation when it comes to the concept of ‘the left’ in American politics. In their narratives, liberals and Democrats are commonly seen and referred to monolithically as ‘the left.’ But put into context, this is a fundamentally false equivalence. Let’s establish one thing right off the bat: There really is no tangible ‘left’ in America’s political mainstream today. Except for a few growing and increasingly influential yet still relatively fledgling movements and organizations such as the Democratic Socialists of America or the Black Lives Matter movement, there is very little leftist thought and action at work in America’s two-party landscape. What many commentators – liberal or conservative alike – often refer to as ‘the left’ is but a poor excuse for actual leftist political philosophy. The primary reason for this misconception is rooted in the anomaly that is our political system and our political culture, which inherently gravitates further to the right than most other advanced contemporary democracies. In addition to this basic conundrum, the political climate of the past four decades – marked by acquiescence and concessions to neoliberalism, a continuation of militaristic-imperialistic foreign policy, reactionary culture wars, a preoccupation with reductionist identity politics, as well as the preservation of privileged self-interest – have effectively eviscerated what modicum of ‘leftist’ thought may once have existed in Progressive Era and post-New Deal American politics. Since then our political system has shifted so far to the right that most Americans today seem to fully accept as a given the simplistic binary political pancake in which liberals and the Democratic Party make up ‘the left,’ conservatives and Republicans constitute ‘the right,’ and independent voters and non-voters alike occupy a space somewhere in-between. As a volunteer and activist for Senator Bernie Sanders’ presidential campaign in late 2015 and early 2016, I knocked on countless doors, called and texted voters across the country, and had many a conversation with a wide variety of people. I spoke with many other activists, groups, members of political organizations, and legions of potential voters of all sorts of political persuasions. Out of all of these conversations, two particular encounters stand out to me to this day. Perhaps it has something to do with the fact that both interlocutors were fellow academics, but even more than that, these conversations serve as exemplary manifestations of America’s political blinders. One of the two conversational partners, a fellow historian in her late twenties – and a die-hard supporter of Hillary Clinton – noted in late 2015 that she had been observing some “strange behavior among liberals” during this election cycle. She was referring to the growing support for Senator Sanders, and the equally growing mistrust and criticism toward Secretary Clinton. From her perspective it appeared almost inconceivable that anyone who was seriously committed to meaningful progress could support Sanders over Clinton. Getting big corporate money and special interests out of politics or working toward a universal single payer healthcare system seemed to be at best secondary, if not at all irrelevant, to her rather narrow and strongly gendered conceptions of modern politics, in which breaking the symbolic glass ceiling of having a female chief executive appeared to trump (no pun intended) any other argument. The notion, that a considerable share of Sanders’s supporters may actually hold deeper political convictions that are further to the left of modern American liberalism, did not seem to fit her political worldview. The second conversationalist was an aging mathematics professor, who seemed relatively open to some of the more leftist items on the agenda of many ‘Sandernista.’ Yet he, too, displayed an almost dogmatic adherence to the old blue dog Democrat view of American politics that seems to revolve only around liberals vs. conservatives, blue vs. red, left vs. right. As we were talking about coordinating our political activism to support the campaign of a challenger to the incumbent in our congressional district, the septuagenarian mathematician asked me about my own political views, by which he meant party affiliation. When I told him that I considered myself a leftist independent who is not affiliated with any party, he encountered, visibly concerned I might add, that “if you’re an independent, you are somewhere between the Democrats and the Republicans.” As a relative novice to all out boots-on-the-ground political activism, this statement shook me to my political core. I wondered if this was indicative of the political worldview in America, and where this would leave true leftists on America’s political spectrum. Just a few months prior to these encounters, I was struck by a realization that had been hiding in plain sight all along. At one of our Bernie rallies, a local activist leader argued in his speech that there is no ‘left’ in American politics, and that there hadn’t been one since Debs. He was, of course, referring to Eugene V. Debs, the iconic union organizer and multi-time presidential candidate of the American Socialist Party during the first two decades of the twentieth century. As a historian of American politics during the late Gilded Age and early Progressive Era, I was, of course, very familiar with Progressive insurgencies in both parties, as well as third party challenges to the established two-party system, but perhaps I had been looking at things from a decidedly liberal vantage point up until then. It was only through careful revision of the works of William Appleman Williams, Martin Sklar, Jeffrey Lustig, and most importantly my re-reading of Gabriel Kolko’s seminal “The Triumph of Conservatism,” that I realized the false pretenses in my own thinking. In the early 1960s, Kolko had broken new ground when he argued that the Progressive Era was really an era of conservatism. Instead of exploring alternative options, Kolko argued, American Progressives deliberately opted for the preservation of the existing hegemonic political, economic, and societal structures, or in Kolko’s words, the “basic social and economic relations essential to a capitalist society.”2 Though often hailed as the lynchpin of reform, Progressive policies and regulation by and large served as a rationalization of the market, with the intention of safeguarding long-term profit. America’s business leaders and ‘Corporate Caesars’ realized that only control of and collusion with federal and state governments, especially under the purview of increased regulatory power vested in government, could protect their interest from either haphazard legislative policies or true radicalism emanating from the populace. A truly leftist space existed merely on the fringes, and it was occupied by individuals such as Eugene Debs or Emma Goldman, or by organizations such as the American Socialist Party or the Industrial Workers of the World. While this fringe left did most certainly influence broader political conversations, it did not permeate the political mainstream enough to create a viable left-wing mainstay in American party politics. As a result, the Democrats and the GOP, both of which experienced Progressive insurgencies at the time, and both of which would recalibrate several times throughout the twentieth century, eventually developed into today’s center-right and right-wing parties, respectively. And this is where so many American liberals, center-leftists, conservatives, and reactionaries get it wrong today. Looking at our two-party system under the premise of a ‘left/right’ duality essentially creates the fallacy of equating ‘liberal’ or ‘Democrat’ with ‘the left.’ While populist liberals like Elizabeth Warren – herself a former Republican – undoubtedly consider themselves to be a part of ‘the left,’ far right commentators, such as the folks at Breitbart, deride “her ideological left-wing purity,” while at the same time branding her as a “liberal icon.”7 Unfortunately, both viewpoints equally conflate liberals with ‘the left.’ Moreover, such invocations of ‘the left’ seem oblivious to the fact that liberals only occupy a space to the relative political left when they are juxtaposed to individuals, movements, or positions on the far right. The effect on our national political culture is disheartening. Not only do we appear to be in the dark about the political anatomies and philosophies of the world we live in, but we seem to lack an understanding of political culture outside of the American context. But the constant reproduction of the misnomer that is ‘the left’ in reference to the Democratic Party or mainstream liberals is not just an issue in our corporate news media. On an episode of NPR’s Here and Now on September 13, 2017, Republican strategist Paris Dennard rejected questions about whether the Trump administration’s tax cuts (which have since been enacted) would primarily benefit the wealthiest Americans as mere “talking points from the left.” As if this wasn’t platitudinal enough, Dennard then proceeded to comment on the issue of healthcare reform, stating that “single payer is not working in Canada or in Europe,” and thus spreading a definitive falsehood. Sadly, National Public Radio, of all places, seems to be particularly susceptible to misappropriating the term ‘left.’ On a recent episode of Here and Now, host Robin Young spoke with former NPR CEO Ken Stern about his new book, in which Stern reflects on his travels and experiences when he left his Democratic “liberal bubble and learned to love the right.” Stern’s subtext and discussion of his book undoubtedly set the parameters of the conversation, and even though Young tenaciously pressed the former CEO on his arguments on political bubbles and confirmation biases, asserting that NPR provides “views from all sides,” she, too, slipped into the fallacy of equating the liberal vs. conservative dichotomy with the left vs. right divide, when she asked her listeners to share their impressions, especially if they themselves were trapped in a bubble either on the left or on the right. As we can see, commentators and correspondents in both corporate and public news media outlets across the board continuously use the qualifier ‘left’ in their publications and broadcasts when, in fact, they are referring to mainstream liberals or Democrats. In doing so, they are not only communicating a false narrative, but they are perpetuating a part of our political culture that is deeply flawed. The conflation of equating Democrats and liberals with ‘the left,’ and juxtaposing them in opposition to conservatives and Republicans as ‘the right,’ may be a convenient and utilitarian tool in our soundbite media landscape, but the downside to this practice is that it only reinforces our national Manichean worldview of wrong and right, black and white, left and right, which severely limits our political discourse and stifles our possibilities. The argument I am making here is far beyond semantics or labels. If Americans want to be understood politically by observers from all socio-political spheres and spectra, if we want to create a more vibrant democracy in which to engage our citizenry, if we want to open our possibilities, if we want to effectively integrate our growing foreign-born population into our political discourse, and if we want to communicate effectively and meaningfully with people and cultures abroad, we need to rethink our own political culture and language. So, how then should we look at the political language of ‘left’ and ‘right’? Some international context might be beneficial. In their modern political capacity, the descriptors ‘right’ and ‘left’ originate from the parliamentary seating arrangements in post-Revolutionary France, referring to pro- and anti-monarchists respectively. While their exact meaning and connotation are contingent upon the specific temporal and societal context in which we locate them, core conceptualizations of the political left generally encompass an egalitarian socio-political and economic character; i.e., a clear rejection of a capitalist economic model with its inherently parasitic nature and the limitations it imposes on true human liberation. Compared to the multi-party democracies of many European countries, which cover a broader range of ideologies and policies on the political spectrum, mainstream political discourse in the United States occurs almost exclusively between the center and the far right. 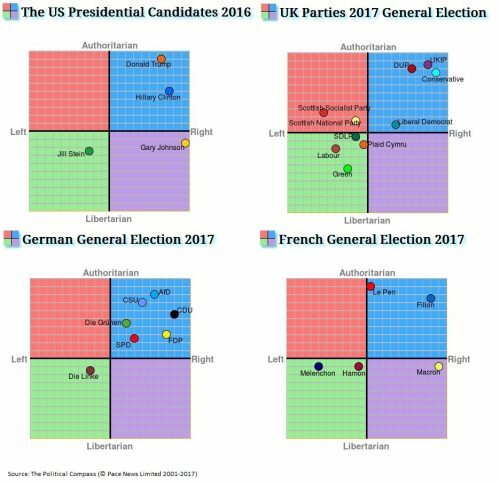 The following charts depict the major political entities in the United States, the United Kingdom, Germany, and France in their respective general elections over the past year. It becomes apparent that, even in the context of growing uncertainty as reflected in more recent developments in Europe — such as the refugee crisis, anti-globalization forces, or increasing anti-EU sentiment — European political cultures still include a far greater space for decidedly left alternatives and counterweights to the prevalent right and conservative trajectories in recent years. When we apply the aforementioned criteria that define ‘the left’ to the political realities of modern America, however, there appear hardly any readings on either left quadrant of the Political Compass. In the 1940s and 1950s America was defined by New Deal reforms and post-war prosperity, but many of these developments structurally and deliberately excluded women and people of color. While the Civil Rights movement successfully paved the way for a whole host of different people and interest groups in their pursuits of greater liberty and equality, America’s political reordering since the late 1960s — which was in many ways a response the social and political upheaval and challenges during that decade — saw an assertion of neoliberalism wedded to a revival of conservatism and reactionism. Since the 1970s the Democrats have effectively positioned themselves at the center-right. Rather than having been overrun by the resurgence on the right, the Democratic Party was an active part and parcel of the conservative swing in American politics. Enjoying a majority in the House of Representatives during both of Ronald Reagan’s presidential terms, the party of FDR and Lyndon Johnson had essentially shed its post-war progressivism, and now became complicit in the deindustrialization and deregulation of the American economy, huge tax cuts for corporations and the wealthy, the ‘war on drugs,’ and the rise of the prison-industrial complex. All this contortion of ‘the left’ is reflected in the issues we debate in our political climate, and more importantly, how we discuss them. Many Europeans generally take for granted provisions such as universal healthcare, strong employment rights, inviolable civic rights, strong consumer and environmental protections, or efficient systems of public infrastructure – just to name a few. In comparison, such issues are always hotly contested in America, to the point that proposals such as Medicare for all, affordable and debt-free education, limiting the influence of special interests in policy-making, or reducing our overdependence on fossil fuel not only seem all but destined to perish at the whims of the corporate oligarchy and its networks of wealthy donors and lobbyists that control the political process, but these ‘leftist’ policies are also dismissed as ‘pipe dreams’ or ‘pie in the sky’ by many liberals and moderates. Herein lies the kicker. For all their alleged commitment to social justice and political equality, American liberals and moderates (you know…the folks who supposedly make up ‘the left’ in American politics), are still often beholden to or imbued with national myths about America’s role as the global exporter of democracy and economic prosperity. Put differently, American liberals are caught in their own delusions and safe logic, in which our protracted involvement in foreign wars just means that ‘our troops are fighting for our freedoms,’ and in which America’s large corporate enterprises are justified in their accumulation of wealth and power (read: in the continuous exploitation of workers and people of color, both at home and abroad, and hence the proliferation of grotesque levels of income and wealth inequality), as long as they continue to be the drivers of research and innovation. This misappropriated version of ‘the left’ in American politics then is a strange phenomenon. Many Americans, both liberal and conservative, often seem to care very little if human beings are being exploited in Asia, Latin America, or the Middle East, as long as folks here at home enjoy artificially low gas prices, get to shop for cheap at Walmart, or get to have their sugar-laden dessert coffees at Starbucks. White liberals in particular often proclaim solidarity with and empathy for disadvantaged and disenfranchised people of color in America as well as in the developing world, but yet too many of them confine themselves to the privileged seclusion of a sheltered suburban life, which was only made possible on a grand scale by racially exclusive big government programs and an economic prosperity that hinged on wartime production and the vast expansion of what Eisenhower called ‘the military-industrial complex’ on the heels of the second World War. Matthew M. Heidtmann is a doctoral candidate and adjunct professor in American history, as well as a political activist. His research revolves around the broader concepts of reform, progressivism, and conservatism in America, especially during the Gilded Age and Progressive Era. Read other articles by Matthew M.. This article was posted on Sunday, February 11th, 2018 at 7:39pm and is filed under "The Left", Barack Obama, Classism, Culture, Democrats, Donald Trump, Empire, Health/Medical, Hillary Clinton, Language, Media, Militarism, Narrative, Neoliberalism, Opinion, Propaganda, Republicans, United States, War Industry.